BIT ENGINEERS REPORT: The Antiterror line installed New York New York from March 2002. 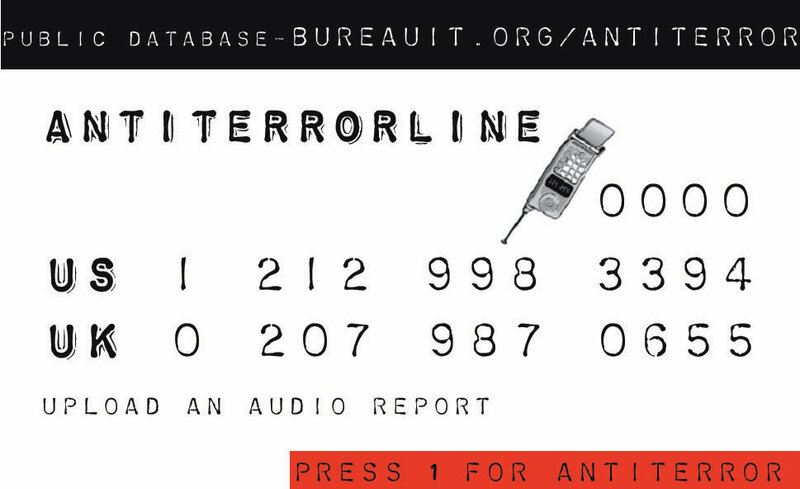 This service enables any phone to act as a networked microphone for collecting live audio data on civil liberty infringements and other anti-terror events. You call in and leave a message. Message may be spoken report or in-progress recording of an anti-terror attack. 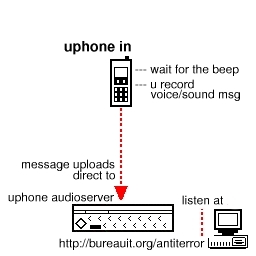 UPHONE uplinks your audio recording direct to the BIT online terror database. An audio accumulation of micro- incidents which individually may be inactionable but en masse could provide evidence for a definitive response. The bit UPHONE is a distributed, publicly readwriteable newsnetwork designed to withstand the militarisation of your government/the martial takeover of your regular broadcast networks. System facilitates information collection under conditions that cannot be accurately predicted / for which you may be unprepared, for example when an antiterror event occurs you may be away from your Desk. The resultant audio files are held in an open database and can be monitored, syndicated or remixed for your purposes. Bureau will provide a full report and system maintenance. BIT advises members of the public to report individuals or activity that may be directly or indirectly associated with anti-terrorist or antiterroristic activity. Public telephone booths provide the most effective anonymizing device for those who would prefer to remain unidentified. Individuals uploading information will not be re-contacted but authorship can be credited. Uphone audio collection is designed to provide higher standards for evidence than other forms of documenting the erosion of civil liberties, such as questionaires, opinion polls and other statistics. Voice and sound data will be uploaded through this system. Inarticulate and non-vocal artefacts such as live civ-lib infringement actuality, will be fully credited, however recordings will need to be 2 seconds or more in length to appear in the database. Unclear recordings should be annotated. If the idea takes root that civil liberties should not be permitted to stand in the way of terrorism, at what point do security measures start to corrode the very society they are designed to protect? Can I speed dial for discreet recordings? Can I set the uphone to break in on FM over my favourite local radio station, using the Bureau's Bitradio kit? How can i get a uphone? Can I syndicate this source?